Warning: This installment of Riffing on Star Wars contains spoilers for The Force Awakens, which, if you still have not seen, then stop reading and go see it. Seriously, go, no excuses! Any discussion of The Force Awakens will ultimately revolve around the murder of Han Solo. His death by the hands of his son, Ben Solo, is the dramatic climax of the film, but when we consider the sadness inherent in the film, we look to everything that happened prior to that moment. The Force Awakens represents a greater sadness and tragedy for its characters when we look upon them as a whole. The sadness grounds the film with a realness that reflects more our world than the fantastical one at the end of Return of the Jedi. Originally the final cinematic chapter in the Star Wars saga, Return of the Jedi literally ended with a celebration party. The future Special Edition even extended that party to multiple planets across the galaxy, like New Year’s Eve coverage skipping from one international location after another as one time zone after another crossed the midnight threshold. The Emperor was defeated, the second Death Star destroyed, and Darth Vader, the fearsome villain of the previous two films, was redeemed through the love of his son. Virtually every happy ending one can think of given the facts and settings presented at the start of the film happened, resulting in a warm satisfaction for everyone but the die hard fan of the Empire. In a way, we can look to the real world equivalent of the end of the Second World War. 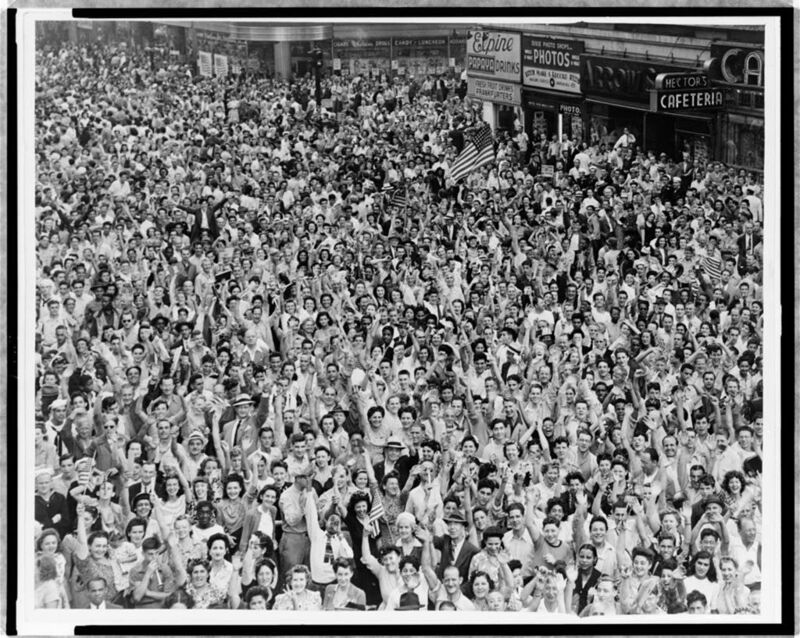 The Second World War essentially ended on two dates as the two major Axis powers surrendered, first Germany on V-E Day, May 8, 1945, and Japan on V-J Day, August 15, 1945. In both instances, people around the world flooded the streets of their respective cities and celebrated the end of the one of the most horrific episodes of bloodshed and death in modern human history. In the immediate aftermath of the Allied victory, a sense of optimism pervaded popular culture, that the world would progress to a better, brighter future in the aftermath of its bleakest times. The United Nations was founded with the intent to help end future conflicts, but in our own history, we know that conflict continued. In short order, the Allies of the Second World War found themselves at odds and a period of Cold War, punctuated by continual threats of mutual destruction, followed for the decades to follow. The Force Awakens and the Expanded Universe which preceded it in 2015 reflected this reality, not the happy ending of Return of the Jedi. From Marvel Comics’ Star Wars: Shattered Empire to Chuck Wendig’s Aftermath, we know that the victory at the end of Return of the Jedi did not result in liberty from the Empire spontaneously occurring across the galaxy. Conflict continued until it stabilized into a Cold War-esque confrontation between the New Republic and the First Order, the state of which existed at the start of The Force Awakens. In a more personal character sense, virtually every smiling face we see in the final frame of Return of the Jedi suffer a form of tragedy in the time period between that film’s ending and The Force Awakens. Luke Skywalker, the farm boy whose heroic journey was cast across all three films, had essentially turned his back on the galaxy to engage on the Jedi equivalent of a walkabout to find himself and the origins of his order. Akin to the post-war peace of our world, Skywalker had set out to build a new structure by which to help ensure peace and justice in the galaxy; a new Jedi Order. As much as our own United Nations has failed to end war, his own dreams were cruelly shattered by Kylo Ren and the Knights of Ren, who attacked and slaughtered his students, spurring his departure from the galactic stage. In his tragedy, we also have Han and Leia’s. By the start of The Force Awakens, the two iconic lovers of the original trilogy are the galactic equivalent of divorced, their marriage broken by the loss of their son to the Dark Side. Even without Luke’s own losses, this fact alone would have been enough of an emotional sucker punch to fill the movie, but it’s compounded by the fact that enough of that love, or at least respect, remained for Han to follow through on Leia’s plea for him to try and save their son. As we noted in the introduction, this gets Han killed. In a broader sense, though, both characters have already suffered a relapse in their own personal story arcs. For Han, after leaving Leia, he ends up a less than scrupulous cargo hauler, which is not far from the same smuggler that we first met in a cantina in Mos Eisely. Damaged from the loss of his son, Han cannot even maintain the life he pursued prior to the event, working in space ship racing, but devolves back to his original profession. In a sadder note, he allows his best friend, Chewbacca, to leave a life of domestic tranquility on Kashyyyk, to rejoin him on his fruitless and not quite honorable missions. The grizzled response Harrison Ford fires back at Daisy Ridley’s Rey when she exclaims, “You’re Han Solo!” is not far from the mark, “I used to be.” Back on Hosnian Prime (the planet which we see everyone gathered on a balcony prior to incineration), Leia’s own life collapsed. If anyone would be labeled a prodigy in the original trilogy, it would be Leia. From a young age, Leia represented her planet of Alderaan as a senator in the Old Republic, before doubling as an agent for the nascent rebellion against the Empire. The defeat of the Empire was not simply a matter of bringing down evil, it was the restoration of freedom and justice back to the galaxy. That it coincided with falling in love with Han Solo and discovering the existence of a brother was simply a blessing on top of a dream carried by Leia through years of struggle and strife. The Force Awakens takes it all and topples it over. Solo is no longer a part of her life, her son has abandoned her and his name, and the New Republic which was intended to improve the lives of billions had become mired in much of the same morose politicking that had made the Old Republic vulnerable to Sheev Palpatine. The only difference in Leia’s life, which separated her from the young woman aboard the Tantive IV fleeing a star destroyer with plans to the Death Star to the older woman in charge of a small rebel resistance is that the Republic is blind to a threat on the outside, instead of within. Stripped of almost everything, Leia, like Han, is left to fill the later years of her life in a role not unlike that which she inhabited prior to her appearance in A New Hope. 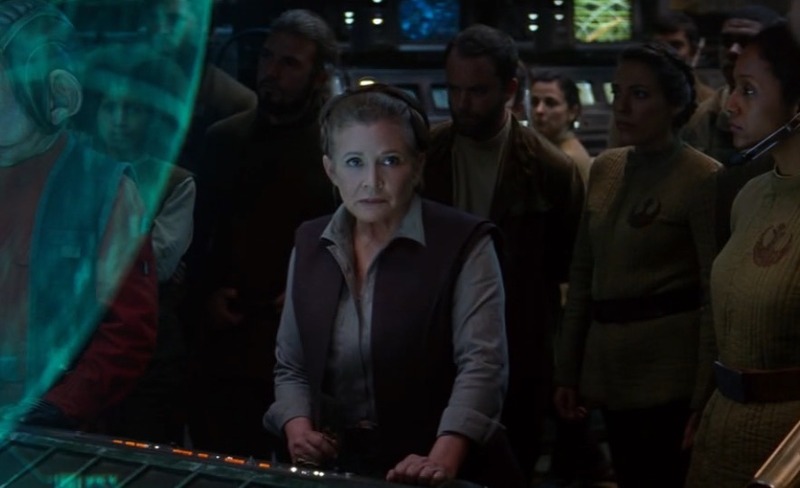 A fighter to the end, the only reason we see Leia smile at all in the film is the hopeful belief that Rey will return with her brother Luke, the last thing left in the galaxy that remains from a period of time when everything was right in her world. The on and off screen suffering of our heroes from Return of the Jedi, while particularly saddening to those fans who grew up believing only the happiest of ending for them, imparts a relatability and grounded reality to The Force Awakens. In both Shakespearean and Greek tragedy, characters are flawed, and often times, it’s their very flaws which bring about their downfalls. More importantly, it’s their flaws which make the characters identifiable to the audience, and so, lends weight to their subsequent tragedy. The Force Awakens and soon to come Episode VIII, have reintroduced Star Wars by revealing the flaws of our characters, allowing all fans, but especially those mentioned above, to more closely identify with our heroes. A happier future could have easily been conjured up, a pleasing one in which our heroes continued one victorious march after another over challenges to their happiness or on a grander scale, the security of a galaxy ruled by a wise and enlightened New Republic. In a way, this was close to what the Legends universe constructed in the 1990s did offer, only veering deeper into the tragic realm in its final years. Yet, at its heart, Star Wars has always been built on tragedy as much as happy endings. In the original, an entire planet is vaporized, a beloved desert hermit is cut down by Darth Vader, and nearly every rebel pilot who set out on a mission to destroyer the Imperial super weapon is killed. The Empire Strikes Back is built on a final act which every character loses something, be it a new love or a hand. In that way, Return of the Jedi, could never really serve as the final word on the saga, because it lacked the tragedy that had become hallmarked of its predecessors. It remains an outlier in the seven films released so far, as the prequel trilogy makes sure to fill its three chapters with tragedy, be it the death of Qui-Gon Jinn or democracy. That THe Force Awakens returned tragedy to the post-Return of the Jedi setting of the Star Wars universe was not a surprise, but simply a return to norm. The sadness that pervaded the past before and throughout the film, while it might have come in any form, was essential to the proper reintroduction of the franchise to the movie going public. While we go to the movie theater on Saturday nights for an escape, in the films and stories we hold highest across any medium, it’s the infliction of tragic realism upon our favored characters that not just draws us in, but endear them to us with the most powerful of emotional bindings. In The Force Awakens, we are never closer to Han, Luke, and Leia.